O Little Town of Bethlehem Ornament - Lovely Etc. I’m just a little bit in love with today’s ornament. There is something about the simplicity and the meaning that I just really love. 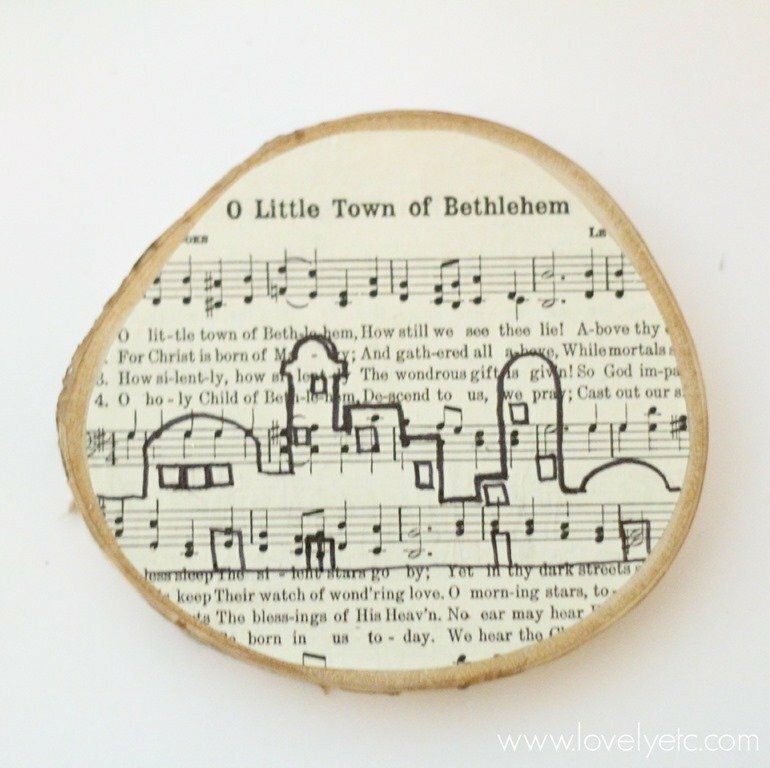 Clearly, to make this awesome little ornament, you need a copy of the song O Little Town of Bethlehem. Mine is from an old hymnal. 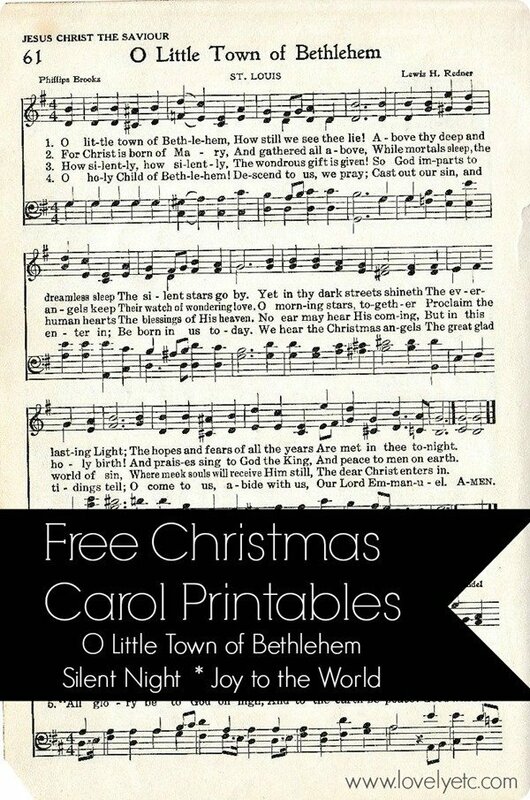 (Did you realize hymnals have all the classic Christmas carols included? 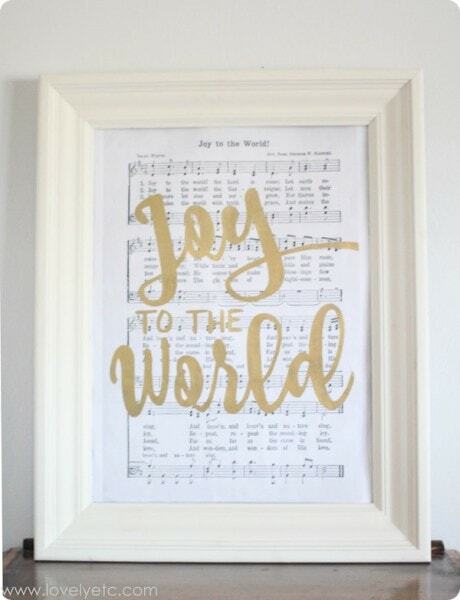 So awesome for Christmas crafting!) I tend to find hymnals by the dozens at estate sales, yard sales, and thrift stores. Usually for about a buck each. But I realize not everyone realized they needed to be on the lookout for an old hymnal. Plus, I’m sure there are places where scoring an old hymnal isn’t quite so easy as it is here in the South. Just download your copies here. 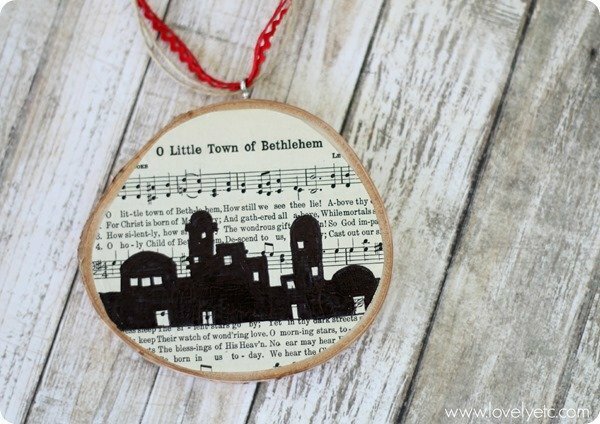 So now that you have your very own copy of O Little Town of Bethlehem, on to the ornament making! The actual making of the ornament is pretty simple. 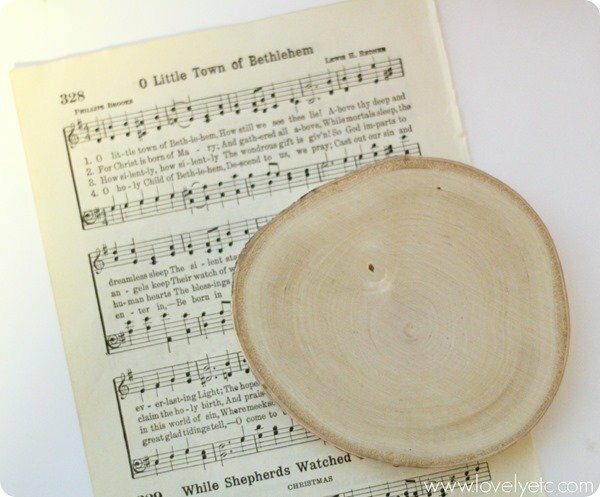 Trace your tree slice onto your copy of the song. Cut your traced shape out, cutting it slightly small than the lines you drew so that a slight border of wood shows once it is attached. Use Mod Podge to attach the song to the wood and then coat the top of the song with Mod Podge as well to seal it. Once the Mod Podge has completely dried, draw your Bethlehem skyline onto the song with a pencil. Fill in the skyline using a black sharpie. Screw an eye hook into the top of your ornament and hang with a string from your gorgeous Christmas tree! 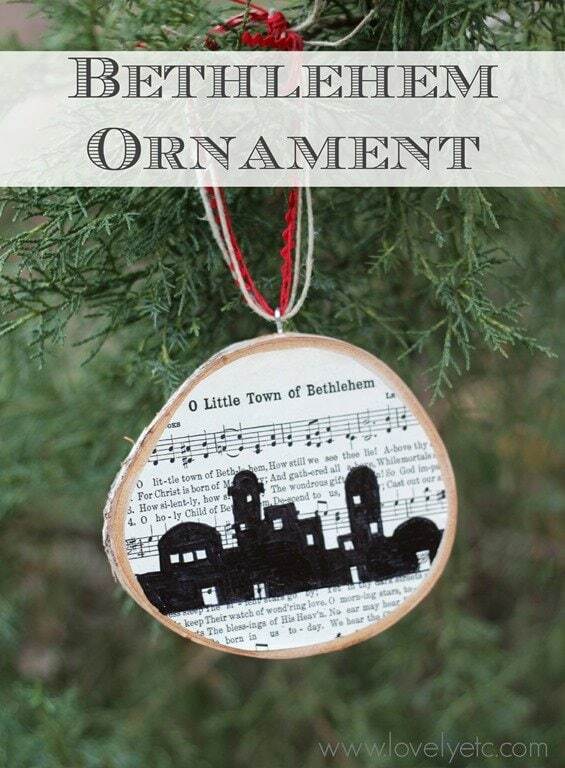 Be sure to check out my fellow bloggers’ fabulous ornaments by clicking the links below. If you are looking for more Christmas ornament inspiration, you can see all of my handmade Christmas ornaments here. 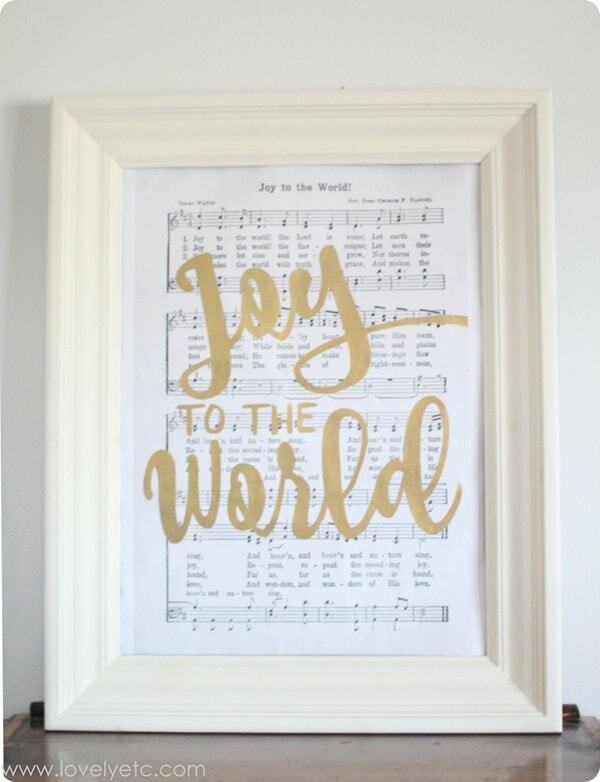 And if you love Christmas music, you will definitely want to see my latest Christmas music DIY. This one also has free printables! What a great ornament! I’m hoping to find time to give it a try, so thanks VERY much for sharing the music. Thanks Judi! I hope you find time – it really doesn’t take that much! If you don’t mind my asking, what Christmas song book did this page come from? I had a Christmas piano book from the 70’s. It was my favorite song book. It has been “borrowed” for life. I lost the front cover many, many years ago so I don’t remember the title except it was red. I played those songs for over almost 40 years so I would know the book when I see it. I would greatly appreciate any help. thanks. 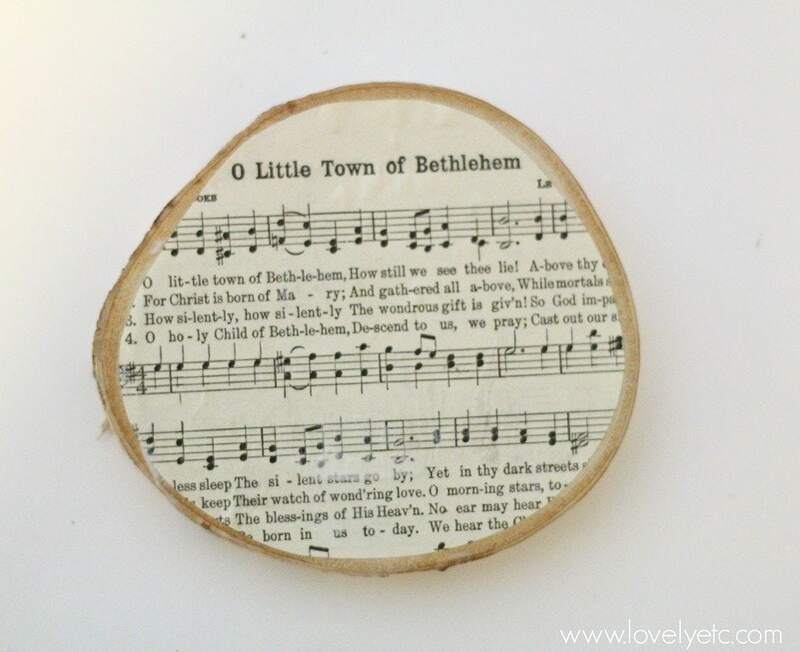 Cynthia, These are actually from an old hymnal. Your Christmas song book sounds wonderful and full of good memories – I wonder if you could find a similar one on ebay or etsy? As for the red music book, try the John Thompson Teaching Little Fingers to Play series. (I think that’s the name; I had a red songbook for piano lessons also 50+ years ago and I think the second book in the series may have been blue; I think there were other colors as the student progressed.) I remember the red songbook because I still have it in the piano bench… I think these books are still around today. Great tips – I hope that helps her find the book she was looking for! About what size is your tree slice? Julie, the tree slice I used was 3-4 inches in diameter. Thank you for providing the hymnal pages for download! I’m going to use it with my Sunday School kids to make musical angels this Advent. What a great project! enjoy! So beautiful! I’m going to make this for an upcoming Jesse Ornament exchange. Thanks for the ideas! Glad it helped! This is one of my favorite ornaments! What size eye hook did you use? Hi Andrea, I am not sure of the exact size but it was pretty small, probably about 1/4 inch. 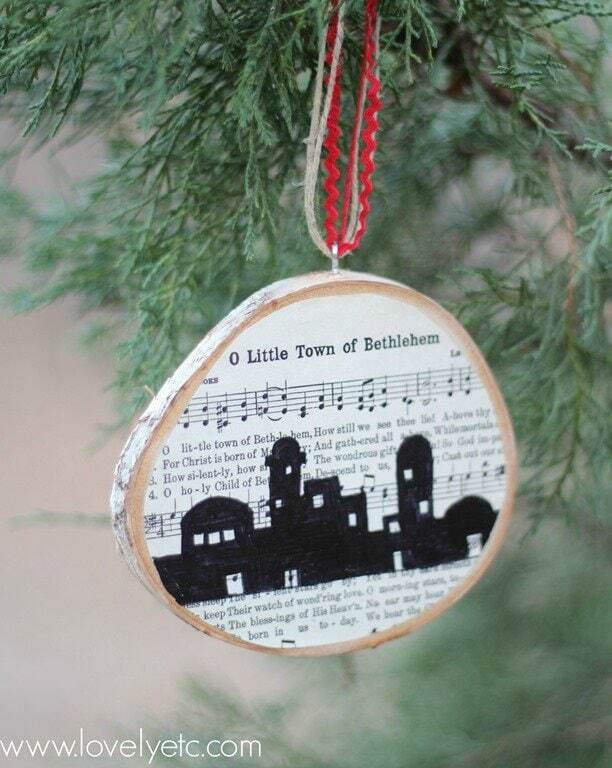 Musical ornaments are my favorite. I love them too! I think sheet music is simply beautiful!